In today's corporate world, the only phrase more apt to set off a round of groans than the word meeting is "conference call." No matter how you host it, conferencing a dozen team members for a two-hour breakdown of the latest process can be mind numbing. Often, employees who are motivated to participate and provide ideas are shut down by the impersonal and difficult to coordinate nature of web meeting. If you want to boost team member participation and make your conferencing more successful, here are seven quick tips to try. Invite the right people to the call. Often, important knowledge is lost because leadership does not invite the true subject matter experts. Greet people on a call just as you would if you were in a room with them. Take advantage of conference call equipment that requires participants to state their name when dialing in. As the system announces each person, say hello. Take control of the call. Send out an agenda ahead of time that lists the purpose of the meeting and states questions that require answers. Encourage staff to come prepared for a discussion. Introduce the call and lead the meeting through each question. Maintain scope. Conference calls often get out of hand when teams discuss lengthy tangents. Allow each person to respond and be heard, but draw them back to the topic at hand. Designate a note-taker. Although everyone in the office should take his or her own notes, someone should officially record minutes. Those notes can be sent to the entire group after the meeting to ensure everyone has the same information. Be prepared to shelve things. A single conference call did not build Rome, and it certainly will not solve all your issues. Shelve items that do not relate to the issue or that require follow up action. Drive follow-up. If items are assigned in the meeting, schedule a secondary meeting to provide updates. Keep secondary meetings quick. Someone should be able to advise the group on action status within a few sentences. Strong conferencing comes from excellent leadership. Rather than boss a group of employees through the meeting or put them all to sleep with lengthy speeches, leaders should guide team participation as they discuss solutions to the problem at hand. In addition to strong leadership skills, successful conferencing requires the appropriate use of business tools. 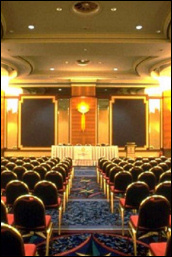 Conference lines, remote web platforms and presentation tools can enhance the efficiency of a meeting. However, improper use of the tools can squash production and create a culture of apathy. Some ways to use conferencing tools effectively are provided below. When dialing into a call from a room with multiple participants, utilize a polyphone or other technology that allows everyone to hear and participate. No matter how many participants are on your end of the line, put your phone on mute when you are not speaking in the meeting. Muting phone lines cuts back on distracting background noise, but participants should ensure they unmute before addressing or asking a question. Use meeting software or vendors that create unique dial in numbers for each call. This reduces the chance of someone dialing into the incorrect meeting and disrupting the discussion. It also provides a safeguard for confidential discussions. It is advisable for everyone to switch their personal cell phones off during the meeting. When using virtual meeting spaces, ensure all participants have access to the appropriate log-ins. If the company restricts log-ins to certain levels, arrange for participants to view the meeting together with someone who can access the space. When staff gathers in a conference room to attend a phone conference, display the virtual meeting space with a projector for all to see. It is advisable for someone to test connectivity and projector settings prior to the meeting. Otherwise, valuable meeting time could be wasted in set up. If you are presenting a PowerPoint to remote users, web-based meeting platforms are always your best choice. You can control the flow of the presentation from your computer. Follow all the tips for a successful web meeting above as well as guidelines for proper presentation design. Since participants may view your slides through different monitor settings or projectors, avoid cluttering slides with excessive text or hard to read graphs. Use simple fonts and include a lot of white space. Graphs should be created using bold, contrasting colors. If web meetings are not available, email your files to all participants before the meeting. Ensure everyone can open the files. When presenting, state which slide or page you are looking at so participants can keep up. No matter what the purpose of your conferencing is, planning ahead and proper utilization of resources increases the likelihood of a successful, productive meeting.